A couple months ago I finished a set of Harry Potter inspired outfits for a special family’s special trip to Orlando. I truly loved working on these and couldn’t be happier with how they turned out! I loved reading the Harry Potter books and I can’t wait until my boys are a little older and ready to read them too! The middle kid got this bowling shirt, which I tried to make look like a house scarf. The placket and the collar are pieced from two different fabrics for the striped look. I used the same dark red fabric for all three outfits, which has swirls and stars and a “magical” vibe. The oldest sister got this dress, also with the pieced straps and sash. The dress has a total of 3 appliqués, one of Harry, Ron and Hermione. 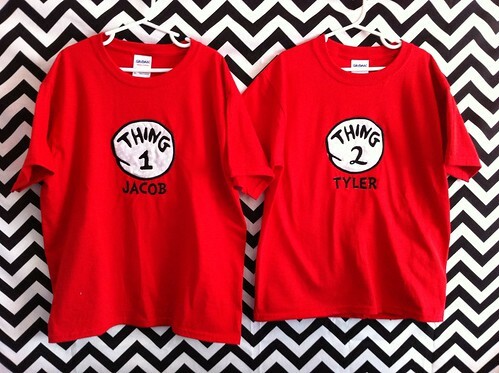 And finally, though I did not have a better photo, I made shirts for the parents to wear too. They are going to the Wizarding World of Harry Potter, so why shouldn’t they join in the fun? I hope they have a wonderful trip. I loved making these outfits, and love how they turned out. When I was researching our Disney World vacation last year, I happened upon a sub-group of the Disboards.com called Disboutique. Essentially a group of sewing enthusiasts who make amazing custom clothing and more. Most of it has a Disney vibe, since the love of the Mouse is what brought them all together in the first place. It is a great community feel, lots of sharing of projects (and frustrations) enabling alerts to sales on fabric and embroidery designs or advice and how-tos for newbies. This group also has an amazing little initiative where they organize what they call “Big Gives” for kids who are going on Wish trips. They pick a kid to shower with gifts and then they organize everyone to give what they can for the wish kid, their family, sometimes more. 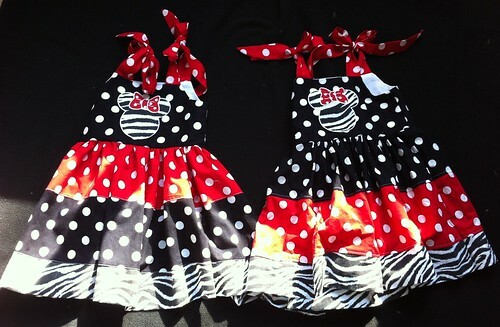 This includes custom outfits, t-shirts, “pixie dust” gifts like stickers and gift cards. It is truly amazing to see this group of people come together to make these kids’ trips really special. I have been fortunate enough to have participated in a few of these Big Gives, and while it does take time and effort, being able to help these kids is priceless. I made these Finding Nemo shirts for two brothers going on a Make-a-wish cruise. The younger brother had been in and out of hospitals his whole life, even had a transplant. He was finally healthy enough to travel for the first time ever. 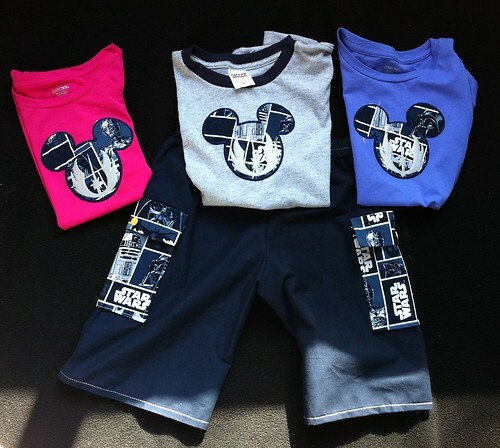 Recently I did shirts, shorts and dresses for a family who is going to Star Wars weekend at Disney World. The “wish kid” is 7, and a huge star wars fan. 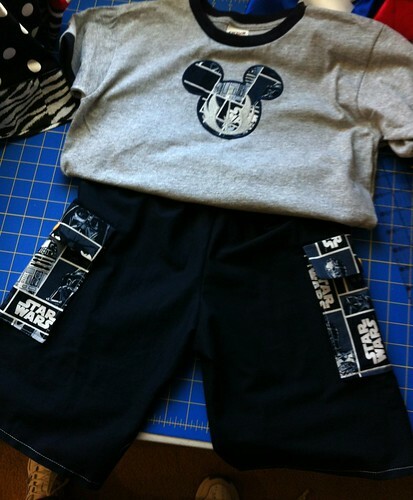 I made these Mickey/Star Wars shirts for him and his 4-year-old twin sisters who are also huge Star Wars fans. I made him cargo shorts to match, and the younger sisters each got Minnie Mouse dresses. I loved making them and the family sent me amazing photos of the kids in their outfits, including them wearing them to school the next day over layers of long sleeves and sweatpants. 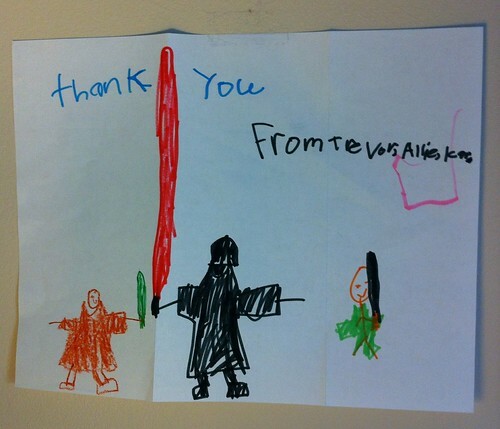 Plus I got the best thank you note ever: a hand-drawn Star Wars scene which I hung in my sewing room. 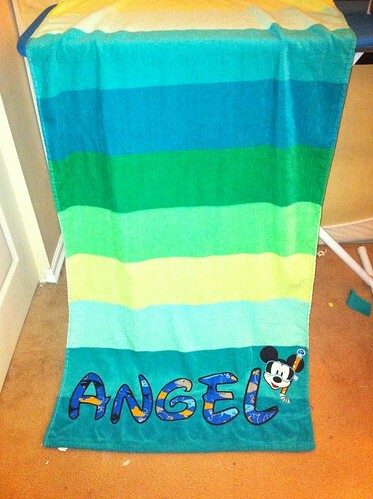 And my most recent project was a beach towel for a Make-a-Wish cruise. So on top of the many projects I have been doing for my Etsy shop, I fit these projects in, because, how could I not? I know they mean the world to these kids. (I mean, seriously seeing those kids wearing their outfits on top of sweatpants was just about the best thing ever!) It takes time, sure, but totally worth it.